This list is a perfect theme for me. I've been wanting to write about gratitude a lot lately and wasn't sure how to do it. Recently, I have learned that for me, gratitude is really the cornerstone of my happiness. I have spent a lot of time in my life feeling sad and letting myself get really wrapped up in negative feelings and missing out on really appreciating the beauty in my life. Part of being wrapped up in negativity is also that we often also forget to appreciate the things we have and express our gratitude to those in our life that mean the most. I think I have ruined a lot of really wonderful relationships because of this. I've made a commitment to myself to not only be more grateful for the small, beautiful parts of my life, but to also make a greater effort to document and share that gratitude. I keep a gratitude journal on my phone and write down at least 3 things I'm grateful for each day. I think that awareness has done wonders for my life. 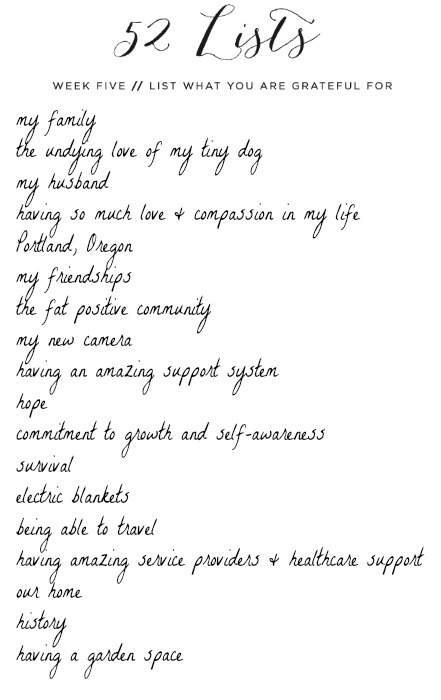 Given that gratitude is such a huge theme in my life lately, I feel like this week's list could have gone on and on, but lists like this are really just the start of something bigger. Interested in the 52 Lists Project? Click here! I'm glad I stopped by and was lucky enough to read this post. I have been doing much the same thing this year and it is doing wonders for me. I loved this week's list (my first one). And I could have gone on for pages, but settled for just one.